Emily is Sloane’s best friend. And that is all most people know about her. That and she is pretty fast, given her track record. But Emily doesn’t mind, she has Sloane who talks to other people to make up for her shyness. They spend every waking moment together, so it all works out. But that all changes when the summer before their senor year, Sloane and her family leave with out a word. No explanation, no good bye, no future address. But there is a list, a list that comes in the mail. This isn’t the first list from Sloane and it’s defiantly not a grocery list. It a “must do” list for Emily and the only thing she has left of her best friend. Emily sets out to complete the list and find her best friend. But skinny dipping and kissing a stranger? Really Sloane? And why does she keep running into Frank? The perfect student who just wants to save the world, and maybe her too? In Since You’ve Been Gone by Morgan Matson, Emily’s in for a whirlwind of life changing events, new friendships and new experiences as Emily is pushed past her bonds, thrown into a wild and possibly life changing summer in hopes of finding her best friend. And maybe some romance along the way too. 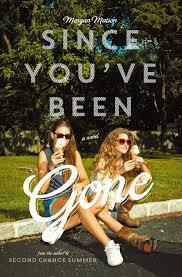 Since You’ve Been Gone by Morgan Matson, is not your classic teen summer romance book. There’s more to it than a boy and a girl. Which is refreshing after reading so many of the same story told with different characters. It’s about friendship, love, loyalties, fun and finding yourself. Morgan writes amazingly true characters. She is an amazing writer. As my former English teacher would say,” she uses juicy words”. She writes in a way that keeps you guessing and interested. Falling in love with this book is pretty easy, it’s putting it down that’s the hard part. I can honestly say its one of the few books that made me want to go out and do something. Not change the world or feed the hungry but it made me want to experience more things. I was torn between getting up and trying to do the stuff Emily had to do and reading more (needless to say reading always won). But after I finished, I had a new found love for my best friend and we made a List of our own with over 50 things that will push us to do thing we wouldn’t with out it. So we are competing to see who can complete more by the end of 2015. We have a very competitive friendship so it should be interesting (I will obviously win). But probably not as exciting as Emily’s adventures. I would give Since You’ve Been Gone a nine out of ten. It’s a fun read for I’d say ages 9 to 25, defiantly a YA Novel. Its a cute romance and a quick read. And I guess in a perfect universe it would have an epilogue. If you’ve read Since You’ve Been Gone by Morgan Matson let me know in the comments below. I’d love to hear your opinion of it! Cath and Wren were inseparable, united by being twins and equal obsessiveness with Simon Snow. That was until they went to college and Wren, being more out going and growing out of Simon Snow, didn’t want to be roommates. Cath doesn’t want friends. She is perfectly happy going through the rest of her college life doing nothing other than writing fanfiction. Online socialization is all she needs. Her roommate, Reagan, and her roommate’s boyfriend, won’t let her be. She soon becomes friends with this odd roommate of hers and learns that her roommate’s cute “boyfriend”, Levi, isn’t her boyfriend anymore. That changes things, but so does Nick. The boy from her advanced fiction writing class. Cath gets into some sticky situations, “Cath didn’t wake up when the door swung open. But she jumped when it slammed closed. That’s when she felt Levi sprawled out beneath her, the warm scrape of his chin against her forehead. Then she woke up.” how can she get herself out of that one? Does Cath even have time for this with the 8th and final Simon Snow book coming out so soon and Carry On, her fanfiction gone famous, not finished. Her fans are waiting, but so is the rest of her life. 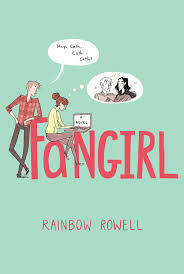 Rainbow Rowell does an amazing job telling this fanfiction-y story with grace and unbelievably believable, character development. Cath’s character development is page turning. She gives all us fangirls hope for finding love, even if it may come unexpectedly. I loved this book. It was extremely relatable, funny and sweet. It was a fast easy read for me, I read it in like two days. I would give it a 9 out of 10. My only two complaints are: one that there was no epilog and two, that the Simon Snow series is not real. Again sorry for the lack of posting I will try to increase my posts! This post is very different from anything I have posted in the past. It is sort of book review/descriptions. This is something I have wanted to try for a while now. So tell me what you think and if you think I should do more reviews of books I’ve read. While you read this I would like you to keep in mind that these are my thoughts and you may have different ones. I Hadn’t Meant to Tell You This, by Jacqueline Woodson, is about two unlikely friends with one thing in common, their mothers both died. Marie a cool girl and Lena a new kid feel drawn to each other for this reason. They soon become great friends. As they begin to confide in each other Marie learns a secret of Lena’s. So Marie is faced with a hard question. Should she tell someone or follow Lena’s wish and keep it a secret? Find out what she decides, in I hadn’t Meant to Tell You This. I read I Hadn’t Meant to Tell You This, for one of my summer reading books. I read it in less than a day. It is short and a fast read. Parts interested me but it wasn’t my favorite book. There wasn’t much that really pulled me in and kept my interest. 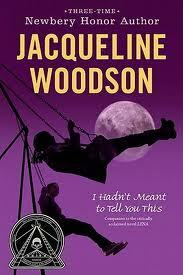 Jacqueline Woodson, did a good job writing it but the story didn’t interest me. It would not be one I would recommend for any one younger than me (12). The book discussed some mature subjects. But over all I would give it like a 6 out of 10.
yes “tv is educational” but every once in a while it’s nice to read a book! so here are some good books that me or my mom or my dad or my brother have read (but not all).